The president isn’t the only powerful figure to break the Twitter barrier. Stephen Okey, assistant professor of philosophy at Saint Leo University, explores how Pope Francis is using the medium in a different fashion. 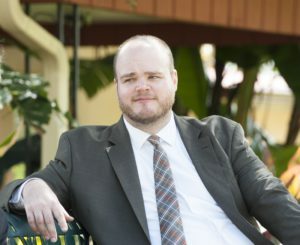 Stephen Okey is an Assistant Professor of Philosophy, Theology, and Religion at Saint Leo University in Saint Leo, FL, where he teaches courses in Catholic theology and ethics. He earned his master’s degree in theology from the University of Chicago Divinity School and his Ph.D. in Systematic Theology from Boston College. He is a contributor and podcast host at Daily Theology, a collaborative Catholic theology blog. He is currently finishing his first book, A Theology of Conversation: An Introduction to David Tracy. Over the last five years, Twitter has become part of how the Catholic Church builds the Body of Christ. Pope Francis sees Twitter in a way similar to how Archbishop Oscar Romero saw the radio: not only as a way to reach the Church, but also as a metaphor for the Church. Romero would describe Christ as the microphone of God, and the Church as the microphone of Christ. While Twitter has become a way of communicating magisterial teaching, it has also become a medium for the church’s reception of those teachings. For example, Pope Francis helped popularize the hashtag #LaudatoSi when he released his encyclical in 2015. Later, many Twitter users connected that hashtag to hashtag #ParisAccords when advocating for US involvement in that agreement. This is an act of reception, where members of the church see the application of Laudato Si’s teachings to specific policy proposals. Of course, managing the @Pontifex account is no easy task. It tweets more or less daily in 9 languages. When Laudato Si was released, some 60 tweets were scheduled to post every twenty minutes. These tweets are generated within the Secretariat of State, the diplomatic arm of the Vatican, and then approved for release by the Pope. This shows that, for Francis, Twitter has a valuable role in both evangelical and diplomatic outreach.